Andy Dalton threw an 18-yard touchdown pass to Mixon to start the comeback, completing a drive that was extended by T.J. McDonald’s personal foul on a third-down incompletion. Mixon returned after missing two games following knee surgery and ran for 93 yards in addition to catching three passes. 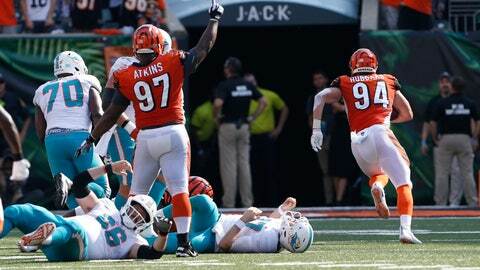 After Randy Bullock’s 20-yard field goal gave the Bengals their first lead at 20-17, Tannehill was hit again by Carlos Dunlap and the ball flew to Hubbard, who ran untouched 19 yards to the end zone with 2:37 left to clinch it.